A debate was taken up by econobloggers on the usefulness of mathematical economics a few months ago . While their discussion focused on the descriptive and instructional power of mathematics, I’d like to make a note on mathematical formalism at the introductory level of economics – that is, the method of teaching economic principles to undergraduates through mathematical models. While this specific example doesn’t demonstrate any explicit failure of math in economic pedagogy, it does raise the question of why our future economists can’t answer some of the easiest questions in their field. My contention is that economics professors have failed to provide students with a solid foundation for individual choice theory – that is, how individuals make choices given their incentives and their real-world options. One of the basic ideas behind economics is that individuals receive utility, or satisfaction, from the consumption of various goods. 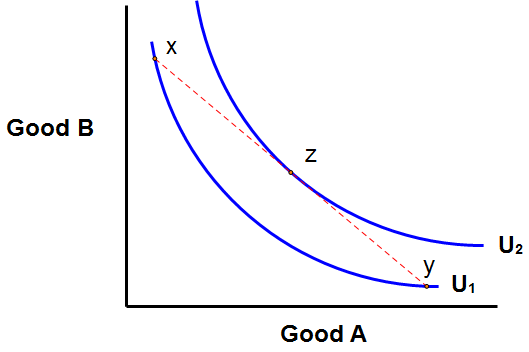 Given two types of goods (A and B), different combinations of both of these goods yield different levels of utility for consumers. This is generally recognized by various schools of thought. Mainstream consumer behavior theory then introduces a concept called “indifference curves.” The idea behind this model is that for a given level of utility, there are various possible combinations of amounts of A and B that give a person the same level of utility. For example, 3 apples and 5 bananas may give me as much utility as 4 apples and 4 bananas, and also as much utility as 6 apples and 3 bananas. Taking all of these points (combinations) together, we can draw a curve which graphically shows all the bundles of goods which yield a certain level of utility. We say that a person is indifferent between all of these bundles – she has no preference of one over another. Figure 1 shows an example indifference curve, labeled U1. 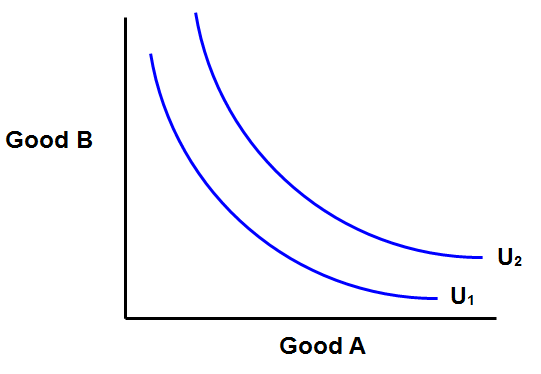 Another indifference curve shown in Figure 1, U2, represents a higher utility level. That is, all bundles on U2 are preferred over all bundles on U1. What is the problem with these models? Indifference curves must have a very specific shape to actually describe what is going on (either consciously or subconsciously) in the minds of consumers. The curves have to be bowed in toward the origin, as seen in Figure 1 (like the bottom left half of a circle). Why is this so, however? Couldn’t we draw a bowed out indifference curve (like the top right half of a circle)? The shape of the curve is justified in neoclassical theory by the idea that people like balance – or that averages are preferred to extremes. For example, consider bundles X and Y on curve U1 in Figure 2. If we take the average of these two bundles, we get bundle Z, which is on curve U2. 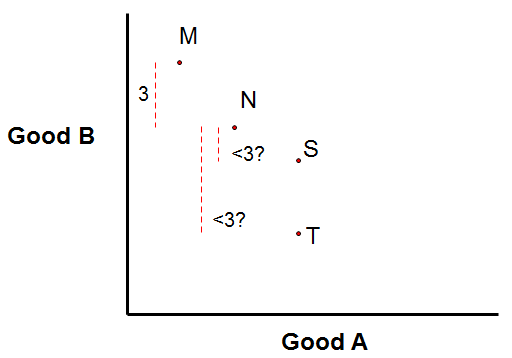 This tells us that Z is preferred to both X and Y, since its indifference curve is higher up. But what is the justification for this? In the presentation slides for consumer theory in my class, “balance” is listed as an assumption. Underneath, as a bullet, it says “also called convex preference.” What this means is that we are essentially told that the curves are shaped that way – we are told to assume it, without a basis in reality or an explanation why. And the entirety of economic theory is based off of this assumption. In my Intermediate Macro class we were told a similar version of the assumption – that people like diversity. The professor justified this by waving his hands and saying that people usually like having some of both goods rather than all of one good or all of another. When a student challenged him by arguing that sometimes a person may indeed choose much more of one good and just a little bit of the other, the professor emphatically agreed and stated that we’re just using an approximate assumption that works most of the time. Naturally, he smiled, this is just an assumption. Before beginning to pick this apart, I’ll note that another (even more mathematical) way of expressing the bowed in shape is to state that the second derivative of the curve is negative. I would definitely not be surprised if there are some professors who, believing that they are being especially rigorous, teach it in this way. Unfortunately, this is no more of a justification of why the curves are shaped that way, but merely a description of the fact that they are. It’s true that the students in class, if they can remember the assumptions, will likely be just fine on their exams and in higher level classes. However, they will not be able to have a deeper understanding that is the seed of thinking that germinates into the highest level of economics – including Nobel Prize-level economics. The Austrian school of economics gives a concrete explanation of consumer behavior that is both easily remembered and is a necessary basis for understanding how people actually function. It also gives a clean explanation of the shape of indifference curves, which neoclassicals would do well to assimilate. Austrians begin by stating that humans act. They act to achieve ends. To achieve these ends, they have to use various means – their time, their labor, their property, etc. The means in the world that we can use to achieve our ends are scarce – we don’t have enough “stuff” to achieve every single thing we might want to achieve. 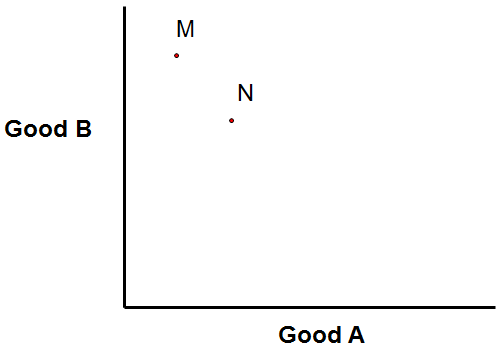 People have preferences, which determine which ends they want to achieve first. Then, in accordance with these preferred ends, people economize, or make the best use of, their means to achieve their chosen ends. An implication of action aimed at achieving ends (as opposed to arbitrary action for no purpose) is that more valued ends (some say more urgent ends) are acted upon before less valued (less urgent) ends. Taking this information, what can we say about people’s satisfaction (due to achieving ends) relative to the amount of goods they have at their disposal? First off, ceteris paribus – that is, assuming everything else remains the same – the more of a useful good that a person has, the more ends he can achieve. With a loaf of bread I can prevent myself from starving. With two, I can feel pretty full. With three, I can afford to keep a dog as well. And so on. Hence, the more of a good, the higher a person’s level of utility. Secondly, there is another very useful law of economics we can derive. Notice that, as was mentioned, people act to achieve their most urgent ends first, followed by a little less urgent, then even less urgent, and so on. Well, what does this mean when we have a limited amount of resources? It means that given a certain amount of goods, we use it to satisfy our most valued end first. Next, given some more of the good, we satisfy our next most-valued end. Given yet another increment of the good, we satisfy the third-most valued end. And so on. Note that with each addition to our stock (or quantity) of the good, we achieve an end that gives us less utility than the previous addition (since it was lower on our value scale). That is, the utility from each additional unit of the good decreases (since we achieve a less-valued end). 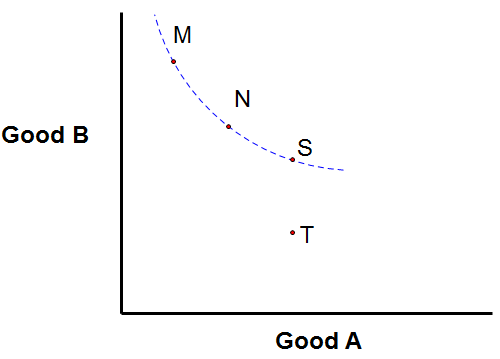 This utility of the next unit of a good is called the marginal utility. 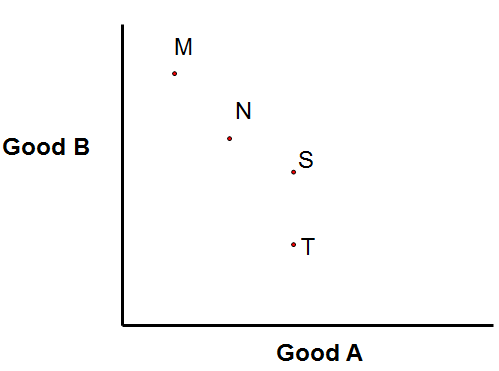 The additional unit of the good is called the marginal unit of the good. The law we just derived in easy-to-follow steps was the Law of Diminishing Marginal Utility. It’s a law in that it necessarily describes how humans work, starting from the simple and uncontroversial empirical fact of humans acting. How does this means-ends framework help us to understand indifference curves? Let’s begin with a graph of two points that we are told lie on a single indifference curve in Figure 3. This graph will eventually be built up into a whole indifference curve, but for now, we have just two of the points (M and N) from the eventual indifference curve. Let’s try to predict which one of the two is likely to be the next point. We know that moving from M to N, we gained 1 A. We know that if we were to gain one more A, we would be able to satisfy another end with A. But this one would be valued less than the previous ones satisfied with A. Furthermore, remember that from M to N we lost 3 of B. We lost the ability to achieve the least-valued things we were able to before with B. If we were to lose even more of B, we would have to start giving up ends that are more and more valuable. So A is becoming less and less valuable, while B is becoming more and more valuable (given the ends we can achieve with each of them). Therefore, if we were offered 1 more of A, we would be willing to give up less of B than we were before. As a real world example, imagine that A and B are bread and water, respectively. At point M, I was able to eat just a little bit of bread, but I had a lot of water – enough to use water to drink, to flush the toilet, to clean the house, to water my garden, to wash my car, and to use as sprinklers for my little cousins to play in. If someone offered to give me one more loaf bread, I would be willing to give up a bunch of water to gain it, even though I would have to give up, say, the sprinklers and the car wash. If someone were to give me yet another loaf, I would value it less, since I’m less hungry at this point, so I would be willing to give up less water than before. The water I am now giving up is more valuable than the water I gave up before, since now I have to give up washing my house, and washing my house was decently valuable to me. If someone wanted to once again give me one more loaf of bread, I would be even less willing to part with my water, because I am beginning to eat into the water that I would be using to flush the toilet. We see, then, that when I have to trade off bread for water, the more bread I acquire, the less willing I am to part with my remaining water for more bread. Why? Because the bread is satisfying ends that are less and less urgent, and the remaining water I have is satisfying the very most important things to me. The graph of the indifference curve has to reflect this. So we know that from M to N I got 1 A for 3 B. For the next 1 of A that I gain, I will be willing to give up less than 3 of B. Maybe this time I will give up only 2 of B. Which point – S or T – satisfies this fact? Now, whether it is very bowed in or not very much bowed in depends on the specific preferences of the consumers, yet the bowed in shape is retained. And this concludes our definitive explanation of why indifference curves are shaped the way they are. Other critiques of the undergraduate approach to economics include the lack of emphasis on mutually-beneficial terms of trade and on the fact that trade involves goods that are not of equal value. A voluntary trade being mutually-beneficial (that is, beneficial for both sides) stems from the fact that if it weren’t, then it would never take place. Given that a trade occurs, it can be inferred that both parties expect to benefit. The second point is that for a trade to take place, a person must value what the other person has more than he (the same person) values what he himself has (this is called an inverse valuation of goods). As such, he is giving away something of lesser value and gaining something of greater value. The same holds for the person with whom he is trading – lesser value for greater value. If this sounds paradoxical, it’s because the subjective theory of value has not been internalized: value is subjective – it is entirely dependent on the individual and what her desires are. As such, it is entirely possible for both people in a trade to be giving away something they want less and gaining something they value more. In fact, this is exactly what happens when a trade is voluntary. As such, trade creates wealth for both sides. Both of these points do in fact appear in intermediate neoclassical theory. However, they are only minor features of the models presented and can be missed entirely if not pointed out – they are not at all obvious when a student is given two equations and told to solve them. These concepts should instead be front and center in introductory and intermediate courses, and not a mere byproduct of the model. They are, indeed, what drives the model. In favor of appearing to be rigorous by using high-level math, we are neglecting the central ideas in economics. Indeed, when economists Ferraro and Taylor went to a major economics conference and asked a large number of economics students and PhDs an introductory-level question about a concept (opportunity cost) instead of an equation, almost eighty percent of them got it wrong . I have tried to show in this article the importance of the means-ends framework in economic analysis. The mainstream approach of indifference curves deemphasizes important aspects of human action that should instead be underlined. Humans constantly use various means to achieve ends – thereby becoming better off. The occurrence of a voluntary trade implies that both parties are better off, and both parties trade away something they value relatively less than what they gain. Understanding these core principles of economics is vital to grasping the importance and relevance of markets. To be fair, there is a way to interpret the question so that it actually turns out to be a relatively valid question. Namely, “could non-binding price floors have a general equilibrium effect on equilibrium prices?” It’s easiest to explain what this means through an example. Imagine that the government set the minimum wage at $50/hour tomorrow. If enforced, there would be massive unemployment of every wage earner who produces below that level – since their labor would literally be made illegal. Now, the question is whether this minimum wage would have an effect on wages above $50; for example, on the wages of people who earn $60/hour. The simplest analysis (partial equilibrium) would answer in the negative, pointing out that $60 is already above $50. However, general equilibrium (taking into account all the different markets in the economy) might yield a different result. Since the people who get paid $60/hour rely on the products produced by lower-paid workers as inputs for their own production processes, they would no longer be able to sustain the same level of productivity. As a result, their wages would drop accordingly. For example, a person who cuts and polishes jewels would likely lose his entire wage if all the people who mine jewels were suddenly put out of work. 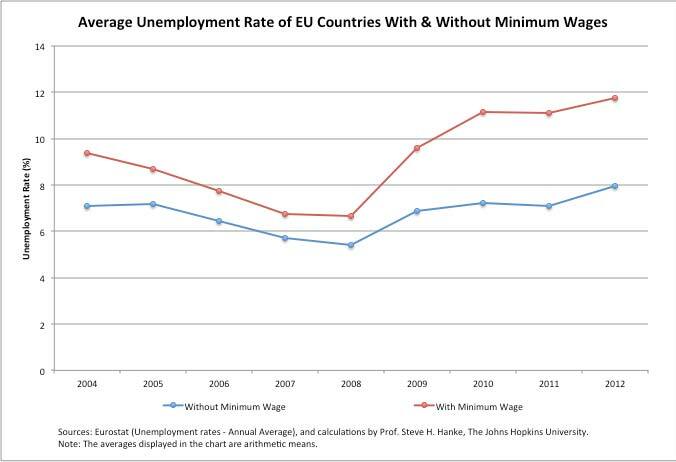 As such, the minimum wage imposed on the other workers lowered his wage, despite it being above the equilibrium price level for his labor market. This is an interesting question to consider, yet, unfortunately, it’s likely not what the student had in mind. Here I have to give credit to my labor economics professor, who did insist on deriving indifference curves from diminishing marginal utility, although she then didn’t justify DMU – which is an important part of the issue.